For Chicago Blackhawks fans, 2010 has held the ultimate hockey high of winning the Stanley Cup, but also some punishing lows. Here’s a look back at 2010 – the good, the great, and even the ugly. The Blackhawks started off the new year by cruising to a 6-3 away game win over hated division rival, the Blues. The team spent most of the month on the road, in fact, but still had a 0.667 win percentage, including an excellent game won in a shootout vs. the Detroit Red Wings at the Joe on January 17th that was carried on NBC; and an exciting overtime win vs. the Sharks on January 28th. A late-season trade brought Eric Johnsson and Nick Leddy from the Wild in exchange for Cam Barker. Johnssson would play less than 10 games for the Blackhawks before suffering a season-ending concussion. Nick Leddy currently plays for the Rockford Icehogs, the Blackhawks’ AHL affiliate. The Blackhawks played just six games this month due to the Olympic break, and of those, four were decided by shooutouts. Six Blackhawks represented their country for the 2010 Vancouver Olympics: Jonathan Toews, Brent Seabrook and Duncan Keith for Canada; Patrick Kane for U.S.A.; and Marian Hossa and Tomas Kopecky for Slovakia. The Canadians brought home the gold; Kane brought home silver. Toews was named Best Forward and received tournament all-star team honors for his play. The Blackhawks shook off the “Olympic hangover” and played some very dominant games in March, but the month was also marked by a couple notable injuries. Kim Johnsson suffered his season-ending concussion in the March 13th game against the Flyers. Then in the March 14th loss to the Capitals, Brian Campbell was boarded by Alex Ovechkin, which resulted in injuries that would keep him out of play until the playoff run. The March 25th game against the Columbus Blue Jackets was the turning point for the “goalie controversy” in Chicago: the Blue Jackets, who had just been eliminated from playoff contention, routed the Hawks 8-3 in Columbus. Cristobal Huet started the game but Antti Niemi finished it; it was the last regular-season game that Huet would play for the team. The “Finnish Fortress” had three shutouts for Chicago that same month – March 18th vs the Kings; March 23rd against Phoenix; and March 31st against the Wild. The Blackhawks had found their playoff goalie. In what was perhaps the most thrilling game of the 2009-10 season prior to the playoffs, the Hawks faced the Devils in New Jersey on April 2nd. Kris Versteeg got a puck past Marty Brodeur with just 0:26 seconds left in regulation play to force overtime; the Hawks held off the Devils through overtime, and then Niemi faced down Brodeur to win the shootout. If there was any doubt left at that point whether Niemi could be a playoff goalie, this game was about as intense and tight a game as possible, as the Devils fought to get the points that would keep them in contention for a playoff berth. It was also notable as the first time the Devils played in a game in which no penalties were called. The Blackhawks clinched their Central Division title on April 4th against the Calgary Flames – their first division title since 1992-93. The Hawks would win five of their six regular season games to close out the season, with the overtime loss to the Red Wings in their final game of the season denying them the one extra point they needed to finish first in the Western Conference standings. No matter: the Blackhawks had 29 home victories, one shy of a franchise record; however, their 52-22-8 regular season record was a club record; and they had sold out the United Center for the entire 2008-09 and 2009-10 seasons. And the Blackhawks would once again head to the Stanley Cup playoffs for the second time in two years. The Blackhawks opened the first round against the Nashville Predators. It was widely speculated that the two Finnish goalies both in their first playoff series – Pekka Rinne for Nashville and Antti Niemi for Chicago – would provide goaltending challenges. Rinne was on a hot streak late in the season, but Niemi was hotter, getting not just one but two shutouts for Chicago in the first round, despite messy team play. The series was split 2-2 for game 5 in Chicago. It looked like the Predators were about the hand Chicago their third loss when Patrick Kane scored a shorthanded tying goal with just 14 seconds left in regulation. The Blackhawks still had to kill off most of Marian Hossa’s 5-minute penalty, but literally seconds after leaving the box, Hossa popped the game-winning goal past Pekka Rinne to send the series back to Nashville 3-2, where the Blackhawks would clinch the series on April 26th to close out the month. The Blackhawks played an intense and exciting series against newer rivals, the Vancouver Canucks. The Canucks had not won a Cup in 39 years of club history, and the Blackhawks had beaten them in the second round during the 2008-09 playoffs. Vancouver hoped to avenge that loss, but was once again handed a second-round exit. The series against Vancouver included not just one but two hat tricks for Chicago: one for Dustin Byfuglien, and one for Jonathan Toews. “Big Buff” became a tour de force in the playoffs and the bane of Roberto Luongo’s existance in the crease. Next up was the series against the San Jose Sharks, who also have never won a Stanley Cup. The Sharks took the Presidents’ Trophy in 2008-09 and topped the Western Conference standings in 2009-10 – the latter of which meant that for the only time during the playoffs, Chicago did not have the home-ice advantage, opening this series in San Jose. The games were incredibly tight and SOGs were high – Antti Niemi had his best games of the entire playoffs during the Blackhawks sweep of the Sharks. As it worked out, it was for the best that the Sharks had had home ice advantage in this case, because it meant that the Blackhawks were able to have this important win on home ice. To stand in the United Center on that Sunday evening late in May was one of the most intense games ever played at the UC. As Kris Versteeg potted an empty-netter to stretch the final winning score to 4-2, cheers erupted, and the crowd of 22,224 was on their feet, tears of joy freely flowing as fans hugged each other, danced in the aisles, and chanted, “We want the Cup! We want the Cup!” Team Captain Jonathan Toews pointedly did not touch the Clarence Campbell Bowl, the trophy for winning the Western Conference playoffs. Fans lingered long and security did not chase them out quickly: the Blackhawks were going to the Final round for the first time in 18 years! 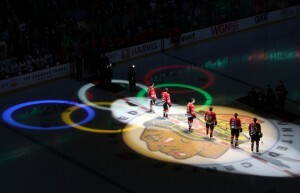 The Stanley Cup Final round opened May 29th in Chicago. The Blackhawks won twice at home, then lost twice in Philadelphia to bring the series home again in the beginning of June. The Blackhawks played decisively before the home crowd for the last time of the season on June 6th, winning 7-4 to send the series back to Philadelphia. The fatigue was showing for both teams, and the Philadelphia arena was a sea of orange. Both Niemi and the Flyers’ Michael Leighton, playing in their first Final games, had shaky play throughout the Final round, but at the end of game 6, Niemi came up with a huge save to keep his team in it during overtime. And then came what was probably the strangest ending to a Stanley Cup Final game in many years: Patrick Kane shot a goal at a seemingly impossible angle through Leighton’s legs, and at first nobody seemed to know where it had gone. The goal light never went on. Was it in? But there was Kane, flying down the ice and leaping into the arms of the surprised Antti Niemi; the puck had shot through a keyhole of space and slid under the cloth that lines the bottom edge of the net. Duncan Keith won the Norris Trophy for his play this past season; it was team Captain Jonathan Toews who took home Conn Smythe honors from the playoffs. With the Stanley Cup win, Toews became the youngest member (22 years, 42 days) of the “Triple Gold Club” – those who have won an Olympic Games gold medal, a World Championship gold medal, and the Stanley Cup. The team arrived back in Chicago in the wee hours of the morning, but certainly nobody was sleeping, and plenty of fans greeted them at the airport. The partying didn’t die down for days – and the players rented a limo bus and took the Stanley Cup out all over Chicago, visiting as many favorite haunts as they could over several days. The championship parade and rally was held on June 11th, and attendance was estimated as high as 2 million people as the Loop area was packed – people stood literally 3, 4, 5 blocks deep as the parade passed and the rally took place. The post-Cup salary cap reality set in less than two weeks after the win when the first trades began to be announced: Colin Fraser to the Oilers. Kris Versteeg to the Maple Leafs in exchange for Viktor Stalberg. Dustin Byfuglien, Ben Eager, Brent Sopel and Andrew Ladd to the Thrashers in a pair of trades that included getting Jeremy Morin in return. Adam Burish and John Madden were not resigned. Goalie Cristobal Huet would eventually be loaned to a Swiss hockey team. Although he had already been traded, defenseman Brent Sopel helped make further history with the Cup: he rode with the Cup in the Chicago Pride Parade on June 27th with the Chicago Gay Hockey Association to honor the memory of Brendan Burke, son Brian Burke. It was the first time the Stanley Cup had taken part in a gay pride event, and it was such a landmark event, that the Chicago Cubs also decided to include a float in the parade. Prospect camp was held July 9-11th, and fans could see the future depth of the Blackhawks. Camp was huge, with more than 70 prospects who were eventually signed to somewhere in the Blackhawks system or released. In the middle of the Blackhawks prospect camp, word came through that defenseman Niklas Hjalmarsson, who was an RFA, had signed an offer sheet from the San Jose Sharks on a 4-year, $14M deal. The Blackhawks had a week to match the offer or the Sharks would claim him; the team matched San Jose, feeling the investment in the 23-year-old defenseman was worth it. As a casualty of that, the team didn’t have the money to re-sign goalie Antti Niemi at his arbitration-awarded salary of $2.75M, so they had to let him go. Niemi eventually signed a 1-year contract with the Sharks for $2M. The third annual Blackhawks Convention took place in late July, and fans packed a downtown hotel for three days of events – including finally getting to see a goal light for Kane’s Cup-winning goal, and getting to hear fan favorite announcer Pat Foley call the win. The Stanley Cup, meanwhile, was making its way around the U.S., Canada, France, Sweden, Finland, and Slovakia. Marian Hossa and Tomas Kopecky were knighted in their home country. Cristobal Huet took the Cup up the Eiffel Tower. Saturday, September 18th marked the official start of the Blackhawks new season, as the team held a public first day of training camp at the United Center. Fans got their first look at the new face of the Blackhawks: the call-ups from Rockford like Jack Skille, Jake Dowell and Corey Crawford were battling for positions alongside summer acquisitions like Viktor Stalberg and Fernando Pisani. A preseason injury put Brian Campbell out of the lineup before the season even started, and fans couldn’t help but wonder if this was an omen of the season ahead. The Blackhawks lost their away season opener to the Avalanche and hoped to come home for their first win. The home season opener, October 9th versus the Red Wings, was so incredible and emotional that even a loss to the Wings couldn’t really spoil it. The Blackhawks had an amazing pregame ceremony, showing highlights of the 2009-10 season and playoff run, and ended it with an introduction of the team. Then members of the last Blackhawks team to win a Stanley Cup – way back in 1961 – helped unfurl the Stanley Cup banner that would be lifted to the rafters. They passed the banner to the members of the team who had been on the ice that day in Philadelphia in June, and those players skated the banner across the ice to where it was raised. It was unforgettable. After a rough start to the season, the only word that could be used to describe the Blackhawks play was “inconsistent” – not only game to game, but period to period. The Blackhawks struggled through the heaviest opening month of play in the NHL; even on January 1st, with nearly half the season under their belt, most teams have not caught up to the number of games that the Blackhawks have played, and the team regularly bounces up and down in the standings. It didn’t help that the team was plagued with one injury or health issue after another: Brian Campbell, Marian Hossa, Patrick Kane, Marian Hossa again, Fernando Pisani, Dave Bolland, Jonathan Toews. It seemed just when one star player would be healthy again, out would go another. After playing three very solid wins before Christmas, the Hawks have stumbled during the holiday, closing out 2010 with one loss, and ringing in 2011 with another. In the highly competitive Western Conference, a .500 winning percentage isn’t good enough; most years, teams need .580 or better. The team has already had more home losses than they allowed the entire season last year; and once again, the rookie goaltender has supplanted the veteran as the goalie that the team is playing better in front of. If the first three months of this season are any indication, 2011 promises to be a roller coaster for fans in the months ahead.